Ok, Erie is hardly the most obscure selection for a day or weekend trip from Pittsburgh, but it deserves a mention here, if only as a reminder, because Presque Isle State Park is simply one of Pennsylvania’s most enjoyable state parks and one of the best ways to spend a Saturday off. One of the factors that paradoxically makes Presque Isle so magnetic is its proximity to the industrialized downtown Erie; driving to Presque Isle necessitates navigating a series of unattractive highways and strip malls, and so arriving at the park itself makes its natural charm that much more evident and appreciated. There are no less than eleven (!) 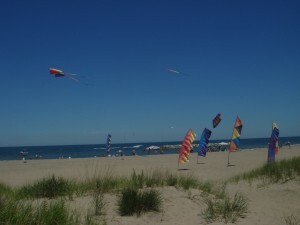 beaches (i.e., designated swimming areas) at Presque Isle, and there are plenty more areas where, although swimming isn’t permitted, you can walk along the lakeshore. A large playground and a bike/surrey rental shop can be found about halfway into the park, and yes, surreys are a common sight at Presque Isle. Also notable are a number of fishing facilities; although I don’t fish, I got a kick out of walking along the dock at the North Pier; the North Pier also has a view of Gull Point (more on that later). One of the nicest features of Presque Isle is the existence of the Karl Boyes Multi-purpose National Recreation Trail. This trail circles virtually the entire length of the island, and it is handicapped accessible. The trail manages to run along the main road through the park, so the good news is that you can basically park wherever you find a spot and pick up the trail from there. Admittedly, the trail is best suited for bikers, and the proximity of the road is predictably just as much a nuisance as it is a perk. Luckily, there are a number of alternate trails in the park. My favorite is Gull Point Trail, which can be accessed via the parking lot for Beach #10 (AKA Budny Beach). The vegetation on this trail is certainly unique, and being no botanist, I can’t hope to describe it with any scientific accuracy; the best I can do is to say is that, in many places, it feels like walking through a narrow corridor whose walls are weeds (just trust me on this one). Gull Point Trail’s name suggests some sort of observation point along the way, and there is indeed one, at the end of the trail; it’s an actual observation platform that one can climb up to get a great view of, well, Gull Point. Yes, this name is accurate too, at least when I went; the coasts were amazingly densely populated by (presumably) gulls. A note on this area: the map (and signs near the end of the trail) indicate that the area is closed between the beginning of April and the end of November. This attempt at freeing the area from any human presence notwithstanding, the trail itself is open year-round, as long as one doesn’t diverge from the marked path (and you really shouldn’t be doing that anyway, but human nature being what it is, you never know). The other trails at Presque Isle are decent enough, but somewhat unremarkable. The most memorable is the Sidewalk Trail (yes, it boasts something of a sidewalk running down its length). In all honesty, it’s memorable because it’s basically a straight path for an absurdly long distance; on the map, it’s shown as a straight line for 95% of its distance, and that’s what it is. If nothing else, though, it’s a useful lesson in depth perception, both to the eyes and to a camera lens. The Presque Isle Lighthouse & Exhibit might be interesting if you’re a lighthouse person, but to be honest, the views of the lighthouse aren’t all that great. That said, the beach around the lighthouse area is one of the best in the park, in my opinion, in terms of both the view and relative lack of crowds. Waldameer Park & Water World, as its name suggests, comprises elements of both a waterpark and a more traditional amusement park. En route to Presque Isle, you simply can’t miss the park; the Ravine Flyer II, its signature roller coaster, actually cuts across the main street. It’s a sight to behold, even if you don’t intend to ride it. This year, the park will be open as early as the first weekend of May, albeit with limited hours and the waterpark section closed. For full details, please consult the park calendar. Note that Waldameer is closed on most Mondays. Across the street from Waldameer is the Tom Ridge Environmental Center, which is a definite must-visit if you have grade-school-age kids. I’d say it could be called a less elaborate version of the Carnegie Science Center, but there are some really neat exhibits that are definitely worth checking out. For example, there are a series of Adirondack chairs that are made out of recycled materials and are surprisingly comfortable. Conservation is the major theme here, as one would expect from the name of the place. Even if you aren’t interested in the exhibits, there’s a cool observation deck that overlooks Lake Erie and provides an interesting angle from which to view the roller coaster. Directions: From Pittsburgh, basically all you have to do is follow I-79 north; the road will basically end in Erie. Follow the signs for Presque Isle (the road will be Rt. 5 West). Note that, somewhat frustratingly, the turn for Presque Isle is NOT MARKED. You’ll want to make a right onto Rt. 832, which basically leads directly to the park.